Senate President Bukola Saraki has accused the national leader of the All Progressives Congress (APC), Bola Tinubu, of supporting President Muhammadu Buhari for selfish reasons.He was reacting to Sunday’s statement by Tinubu who claimed Saraki defected to the opposition Peoples Democratic Party (PDP) because he wanted an automatic return ticket. “However, no progressive enactment bears his name for he cared not for progress. He has been more focused on changing the rules of the Senate to favour himself and changing the order of elections so as to coincide with his selfish designs.” Tinubu said others who defected alongside the Senate president received “similar assurances by the PDP as to their offices.” He said the APC, however, “refused to make such bargains,” because they were undemocratic vestiges of an old political dispensation. “In the final analysis, the reason for the defections is as clear to see as it is crooked in its motives. The APC seeks to reform governance and politics. However, many powerful people believe the established system assures their maximum benefit. Progressive reform would defeat them. They must fight reform and never be allied to it. Thus, they had to leave the APC,” Tinubu declared.But Saraki argued there was more to Tinubu’s denunciation than met the eye. “Tinubu himself will recall that during the various meetings he had with me at the time he was pursuing reconciliation within the APC, I raised all the above issues. I can also vividly recall that he himself always expressed his displeasure with the style of the government and also mentioned that he had equally suffered disrespect from the same government, which we all worked to put in office. I also made the point that whatever travails I have gone through in the last three years belong to the past and will not shape my decisions now and in the future. Challenging anybody to produce facts showing his defection was all about “automatic ticket and sharing of resources,” he added: “Let me reiterate my position that my uncertain and complex relationship with Tinubu has been continually defined by the event of 2014 when myself and other leaders of the APC opposed the Muslim-Muslim ticket arrangement about to be foisted on the APC for the 2015 polls. “It should be noted that he has not forgotten the fact that I took the bull by the horns and told him that in the interest of the country, he should accept the need for the party to present a balanced ticket for the 2015 general elections in terms of religion and geo-political zones. Since that time, he has been very active; plotting at every point to undermine me, both within and outside the National Assembly.”Unmoved by Saraki’s self-defence, the APC fired another salvo yesterday, declaring him unfit to govern the country on account of alleged corruption and selfish ambition. In a statement by National Publicity Secretary Yekini Nabena, which listed the alleged sins of the lawmaker, the APC warned Nigerians to be “wary of a man whose personal ambition will always supersede the interest of the majority and national interest as currently displayed in the National Assembly. 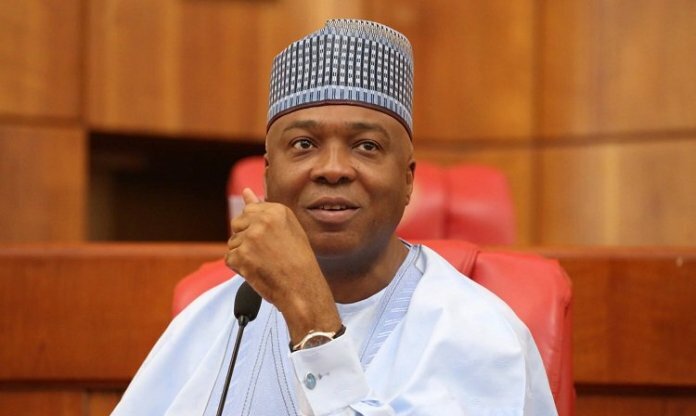 “While Saraki refuses to reconvene the National Assembly, the 2019 election budget of the Independent National Electoral Commission (INEC) is dangerously delayed, an action deliberately taken to sabotage INEC’s ability to conduct free, fair, transparent and credible elections in 2019.”The party was reacting to a recent interview granted by Saraki to international news organisation, Bloomberg, where he expressed an intention to seek the nation’s highest office on the platform of the PDP.